NORFOLK, VA (CelebrityAccess) — Old Dominion University in Norfolk has announced plans for a $65 million dollar overhaul and expansion of S.B. Ballard Stadium. Currently managed by Spectra, the 20,118-capacity stadium first opened its doors in 1936 and currently serves as a home to the Old Dominion Monarchs NCAA football team. The upgrade plans include demolishing the east and west stands, which will be replaced with new seating that includes mid-field fixed back seats and bleacher seating with backs and expanded legroom. 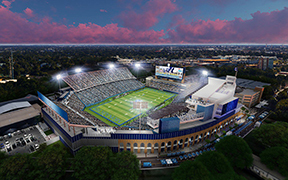 Plans call for increased traffic flow into the stadium, with new points of access to the venue, including an arched entrance gate at the “historic” Foreman Field entrance on the east side of the stadium that hearkens back to its original architecture. A new mezzanine-level concourse, a 30-foot-deep deck, will also be added, providing views of both the field and concourse level below. As well, the refurb will include more than 45 new food and merchandise point of sale locations, and expanded restroom facilities will be added on new 30-foot-wide ground-level concourses on both the east and west sides under the new grandstands. The planned upgrades will commence in the summer of 2018 and will be concluded before the home opener of the 2019 football season, the University said. Unlike many venue upgrades, funding for the project will not rely on cash from the city or state and will instead be funded by athletic revenue, private funding and bond proceeds, the University said. “We are going to have a great product – an enhanced facility that our students, friends and fans and the entire university community will be very proud of and will enjoy,” DuBois added.